Please note that this is a curated event calendar, targeted specifically at the interests of our readers and focused on special events, rather than regularly occuring events like restaurant specials, open mic nights, etc. Submitting your event does not guarantee a place in our listings. All complete submissions will be considered; and, if published, may be edited. Upload a .jpg or .png file under 6 MB in size. Image must be square and a minimum size of 400x400 pixels. We require an email address, in case we need to contact you about your submission. These details won't be visible on the listing. 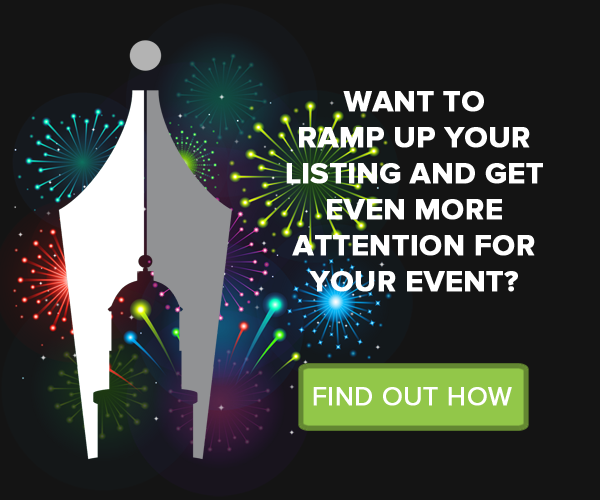 Want to ramp up your listing and get even more attention for your special event? Find out how our featured listings, ad packages, and event guides can work for you. Send an email to [email protected] and tell us what you're planning. We'll suggest some marketing options to give you the best visibility.